A recent article published by Plane & Pilot highlighted one of our most successful collaborations of 2014. 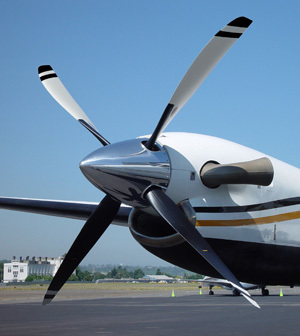 Over the last few years, our engineering team worked closely with Raisbeck Engineering to develop swept aluminum propellers to compliment their performance systems for the Beechcraft King Air series. Those props debuted last year and helped make 2014 one of the top 3 sales years in Raisbeck’s history. You can read the full article on the Plane & Pilot website. Everyone at Hartzell is extremely proud of the results delivered by our partnership with Raisbeck. When we attend air shows around the country, it feels very rewarding when King Air pilots tell us that their aircraft look better, fly quieter and perform stronger than ever before. We are pilots ourselves, and we know how great it feels when an investment in your aircraft really pays off. That feeling drives our team to continue innovating to create the best aircraft propeller technology in the world.